The hits just keep on coming: Guardians of the Galaxy Vol. 2 is another fast-paced, funny blockbuster courtesy of Marvel Studios. There's a moment midway through Guardians of the Galaxy Vol. 2, as the Yaka Arrow of the whistling Yondu (Michael Rooker's blue-skinned, mohawked mercenary) weaves a neon trail through the chest cavities of an array of disposable baddies, that a secret element of the surprise blockbuster franchise becomes evident: Guardians of the Galaxy is basically a cinematic laser-light show. It's a bright spectacle, backed by familiar '70s rock tracks, that allows viewers to turn off their critical thinking and simply soak in the fun. Heck, there are more colors in certain five-second stretches of Guardians of the Galaxy Vol. 2 than there have been in all the DC Comics films combined (someone tell Batman and Superman that there are ways to convey grittiness without every image being brown or gray). The gang's all back for Vol. 2, and that's the sequel's biggest strength. Instead of having to jump through the origin-story hoops, we're immediately thrown back in with these universally lovable misfits. Chris Pratt recaptures the rugged charm and doofus swagger of Peter Quill (aka Star-Lord). Drax (Dave Bautista) gets even more laughs with his unknowingly blunt and literal speaking manner. Rocket Raccoon (voiced by Bradley Cooper) remains the same fast-talking, gunslinging smuggler. Zoe Saldana once again plays Gamora, the green-tinted straight woman forced to endure the boys' antics. And tree creature Baby Groot takes the simplicity of the "I am Groot" formula from the original and imbues it with 20,000 levels of cuteness (even the bad guys fess up to his adorableness during the film). It seems blatantly obvious, but it's funny how easy enjoying a movie can be when all the main characters are immensely likable. This time around, the Guardians find themselves on the run from the golden Sovereign race after Rocket gets a bit greedy during a protection job. Along the way, they encounter Quill's mysterious father, Ego (Kurt Russell, still radiating charisma), and he and his empath alien companion Mantis (Pom Klementieff) whisk Quill, Gamora and Drax off to a gorgeous paradise planet, also named Ego, that he alone inhabits. As questions arise, Quill's long-lost dad begins to reveal his past and his son's untapped potential for cosmic power. 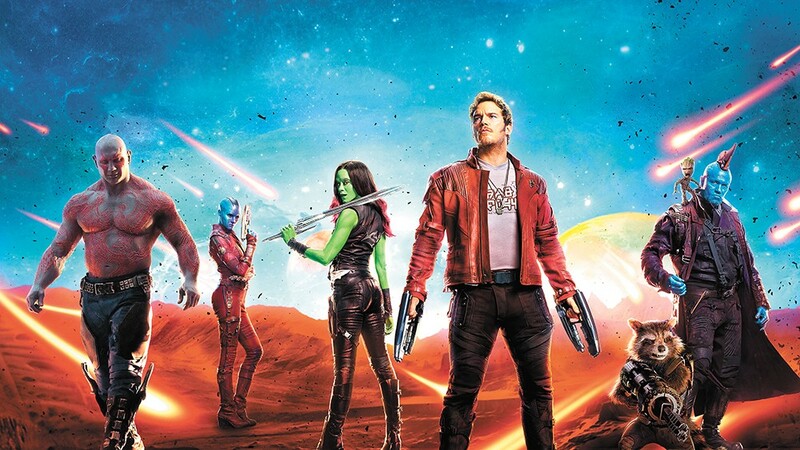 Meanwhile, Rocket, Baby Groot and one of the original film's foes — Gamora's sister Nebula, a current bounty capture by the Guardians — run into a familiar pack of space pirates under Yondu's command, and it all comes to a head when things on Ego take a turn for the potentially universe-destroying worst. After breaking out with the original film, writer-director James Gunn returns to revel in the irreverent freedom of summer blockbuster bliss. Gunn doesn't direct action sequences as much as he crafts music videos packed with colorful carnage set to tunes from Quill's mixtapes. In the Kill Bill films, Quentin Tarantino made hyper-violence stomachable by presenting it in a cartoonishly over-the-top manner, and Gunn follows the same principles, toning down the gore and making the film into the kind of live-action cartoon that parents will actually take their kids to see. When the hues are so dazzling and everything syncs so well to the upbeat songs blaring from one of Star-Lord's cassettes, you lose track of the (mildly horrific) body count. Gunn also knows the value of shifting focus for comedic effect, and to avoid being overwhelmed by continuous action. Instead of employing background gags, he makes such gags the foreground focus, with the chaos of the battles serving as an afterthought. A space battle with hundreds of ships darting through an asteroid field, for instance, becomes more about Quill and Rocket egotistically quarreling about who gets to pilot the ship, and a fight with a tentacled monster centers on an oblivious-to-danger Baby Groot dancing to his little wooden heart's content. At times, Gunn's script and his love for the soundtrack can cross over into self-indulgent territory, whether he's repeating jokes that misfired on the first attempt or continually drawing attention to the need for source music. But for the most part, the humor hits more than it misses, with plenty of fan service and Earthly pop culture references (hello, David Hasselhoff). Guardians of the Galaxy Vol. 2, Guardians of the Galaxy Vol. 2 3D and Guardians of the Galaxy Vol. 2: An IMAX 3D Experience are not showing in any theaters in the area.